Lansing — Deer hunters planning to hunt bucks in northwest Lower Michigan this fall will need to look closely before they pull the trigger. A new mandatory antler point restriction was approved by the Natural Resources Commission in June for 12 counties in the northwest Lower Peninsula. Hunters will be allowed to shoot only bucks with at least three or more 1-inch points on one antler. The rules specify that the first buck has to have three points or more on a side. An antler on a second buck has to have four points or more. The new rules affect Antrim, Benzie, Charlevoix, Emmet, Grand Traverse, Kalkaska, Lake, Manistee, Mason, Missaukee, Osceola, and Wexford counties. They go into effect this fall and stay in place for five years. Leelanau County, also in the region, already has antler point restrictions, for a total of 13 counties. Getting approval for antler point restrictions is a lengthy process. DNR wildlife staffers first survey citizens in the proposed area to gauge approval for the change. At least 50 percent of the people contacted have to respond to the survey, then 66 percent of the hunters who respond must approve of it. The proposal is then brought to the Natural Resources Commission. Ratajczak’s organization began pushing for the change in 2011, first attempting to get APRs in Benzie and Grand Traverse counties. Both are adjacent to Leelanau County, which already has the restrictions. State wildlife officials at that time were developing a regional deer management plan. The initial APR proposal didn’t fit into that scheme, Ratajczak said. The DNR mail survey of 2,000 hunters generated an 80-percent response rate, and 69 percent of the hunters who responded approved of the regulations, according to state wildlife officials. Ratajczak said harvest data from Leelanau County show hunters are killing as many bucks as they did before antler restrictions were implemented and that “the bucks are bigger.” The number of hunters who hunt there has not declined, suggesting that antler point restrictions do not drive hunters away. 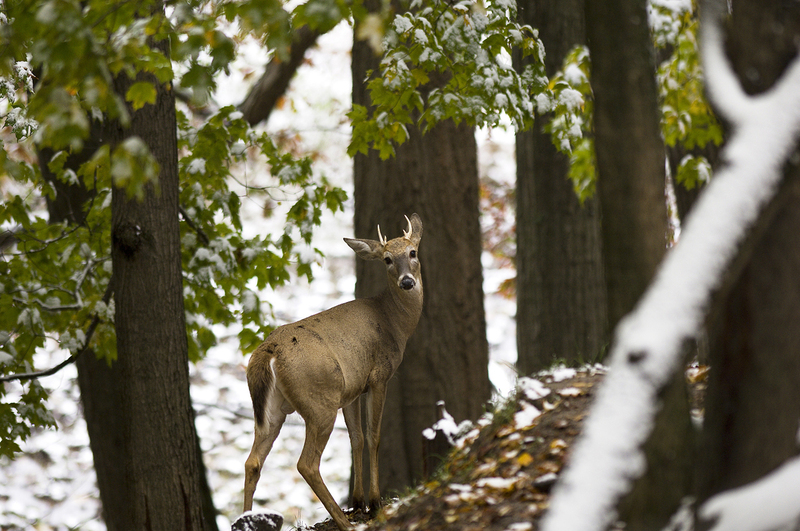 Michigan has five other deer management units where antler point restrictions exist. Those include DMU 117 on Drummond Island, DMU 122 at Norway in the western Upper Peninsula, DMU 245 on South Fox Island, DMU 145 in Iosco County, and DMI 115 on Beaver Island. Rudolph said APR has not dramatically changed deer populations. Proponents of APR have argued that not shooting younger bucks and shooting older, more developed deer creates populations with larger, older, more developed deer. “We have seen all sorts of conclusions and ideas after restrictions are put in place, but some of those are flawed in their reasoning. We haven’t seen dramatic changes and have no evidence of it,” Rudolph said. “But it (antler restrictions) is not something we see as a concern, so we let it play out. This entry was posted in Uncategorized and tagged Conservation, Deer, DNR, Hunting, Lower Peninsula of Michigan, Michigan Department of Natural Resources, Wildlife. Bookmark the permalink. Hi Howard. I always enjoy your articles. The TB zone (N.E. Lower) also has antler restrictions for the DMU487, but only if you buy a combo tag. If you buy a straight bow or firearm deer tag, it doesn’t apply. I wish the DNR would make their rules simple. Howard, I believe this is a good step forward for the future of good quality deer hunts for our kids. I wish the whole state of Michigan would be under these restriction. Thanks for the comment Larry. I am curious to see the extent it changes the age structure of the population down the road. Horrible idea, there are many deer who develop more than 5 and 6 points there first year, those are the deer you want to shy away from harvesting, 1 buck rule works, look at our neighboring states that have the 1 buck rule, better deer herds period. Antler restriction still allows hunters to destroy deer herds that have healthy breeding bucks. 1 buck, control doe populations with county specific doe harvest. I think antler pint restrictions are great and we should continue them for many years to come. I feel this antler point restrictions is a very bad idea. In the area My family has been hunting for over 30 years. We only know of 3 deer that have net the restriction. 7 of my family menbers along with my wife and son stopped hunting. We have not plug in are frezzer in four years we do not care for the antler we are meat hunters. Everone tell me to take a doe then. Would but there is only 200 doe tags. In my area we have 6-7 buck that area between the age of 4-6 but they do not meet the restriction. What to do.